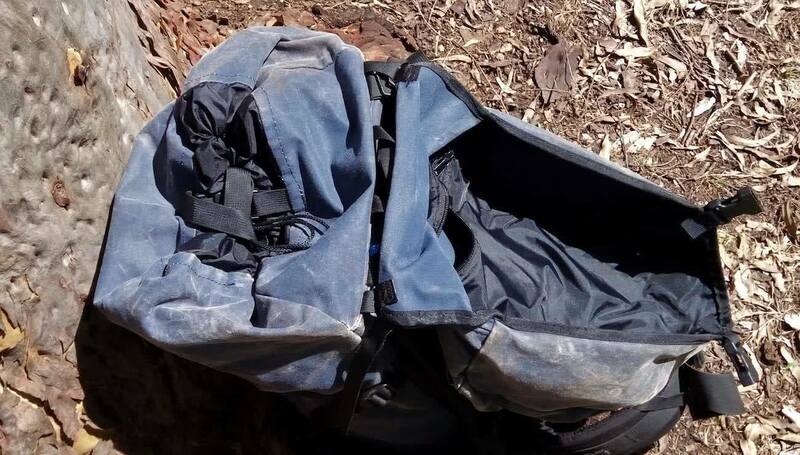 Explorer Stuart Nicol has had a Summit Gear Korowal Backpack for the last 3 years and has put it through hell in the Aussie bush. Here he gives us a rare long-term review that shows just what the Australian brand is capable of. 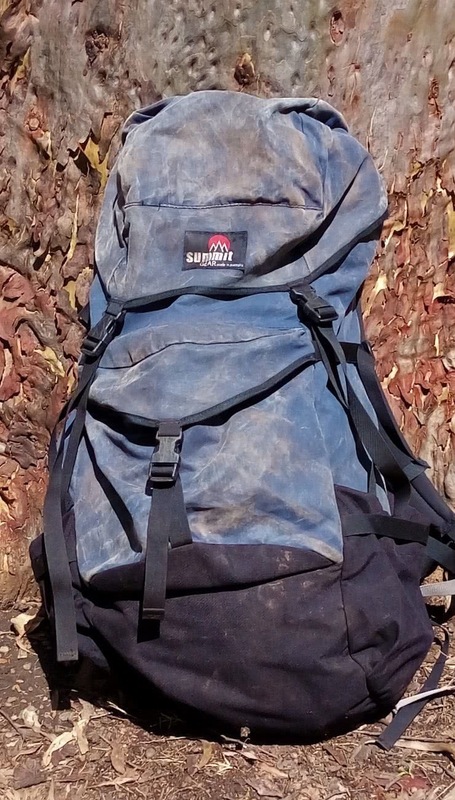 Summit Gear is an Australian company, manufacturing packs since 1983. Their packs are optimised for the equipment destroying conditions in Australia. Their gear will last for years in conditions in which overseas packs might last for a couple of hours. This company is unique in that the packs are tailor made to fit the customer. The Korowal pack is their premiere bushwalking pack, a 70-80L bag. They also offer a range of other packs in other lengths and for other activities (e.g. canyoning). I first heard of this company from a bloke on the Western Arthurs and I was impressed by it. 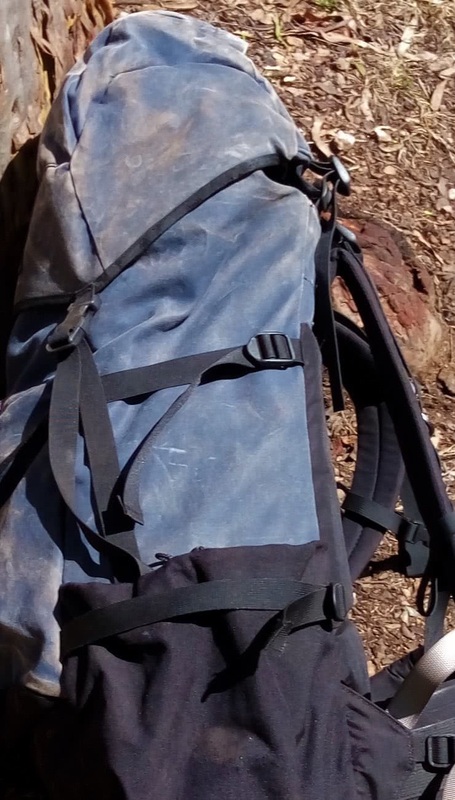 I bought my pack when I was in Perth over the phone and have given it a beating over the last three years. On first impressions, the pack looks uncomfortable and impractical. Looks are deceiving, other packs are designed to be sold easily by retail staff with little training. This is designed to perform. Hold on a minute, is the pack canvas? Yes, but it isn’t heavy. At 2.5kg, give or take for sizes, it is roughly the same weight as a synthetic bag of the same capacity (e.g. Osprey Xenith). It all comes down to its optimisation and not adding useless knickknacks. The pack has an aluminium internal frame (6061-T6 alloy), common in most packs made for Australian conditions. Their website doesn’t give a load rating, but I have been able to carry 27kg without an issue and could probably push that further. The pack is simple, one main compartment and three external pockets. There are two zips, three buckles and a hip buckle. This is an order of magnitude less than other competitors. The simplicity makes it indestructible, I have accidentally rolled my pack down a cliff and nothing broke! My mates were impressed by this feat. Despite its looks, this is the most comfortable pack I have owned. After going through six packs in 10 years, this is the best of the lot. No breaking in was needed and the padding, what little there is, is in all the right places. Canvas has been around for a long time and appears to be ‘old technology’. This is far from the truth, modern canvas is a poly-cotton. In this hi-tech fabric, natural fibres are wrapped around a synthetic core. Modern canvas has a few advantages and disadvantages when compared to pure synthetic material. Its heavier per unit area than synthetic material and it takes a while to dry. However, its more waterproof, durable and longer lasting. Synthetic materials degrade faster in sunlight, giving them a shorter lifespan when hiking. They also tend to delaminate over time. Like all good camping gear, canvas is best kept out of the sun in a cool and dry place when stored. Unlike synthetic materials, canvas is naturally waterproof. The natural fibres swell when wet to seal out the water. Manufacturers and the customer also coat it with a wax coating to repel and keep water out. This removes the need for a pack cover, which is easily torn and holed. However, I also use a waterproof pack liner for river crossings and heavy rain. So, how does one get the right size? Easy, if you’re able to visit the shop (in Katoomba in the Blue Mountains) go and visit them and they’ll measure you up. If not, you can measure yourself to fit on of their many ‘standard’ sizes. They fix the shoulder straps to your back length and chose a hip belt for the size of your hips. 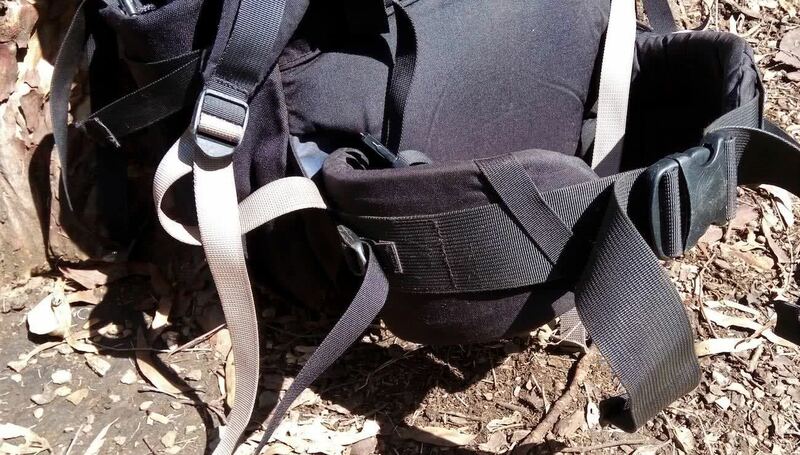 The harness and frame is pretty standard for Australian packs, shoulder straps, stabilising straps, sternum strap, and a hipbelt. The philosophy of this pack is that fine tuned sizing, as performed at most hiking shops, is not necessary. A couple of millimetres isn’t going to make a huge difference. While initially sceptical, I’m now a believer in their philosophy. 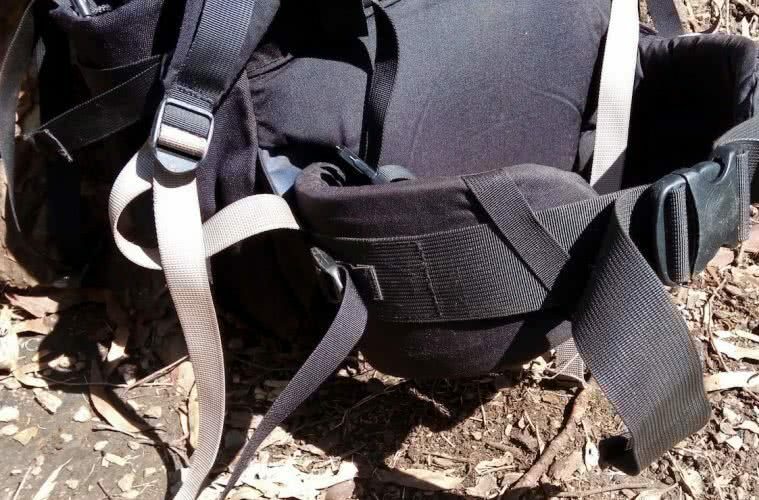 The issue you have with a pack that is not adjustable is that you can’t loan it. This currently isn’t a major issue for me as I have other packs to lend, but it is a slight drawback. 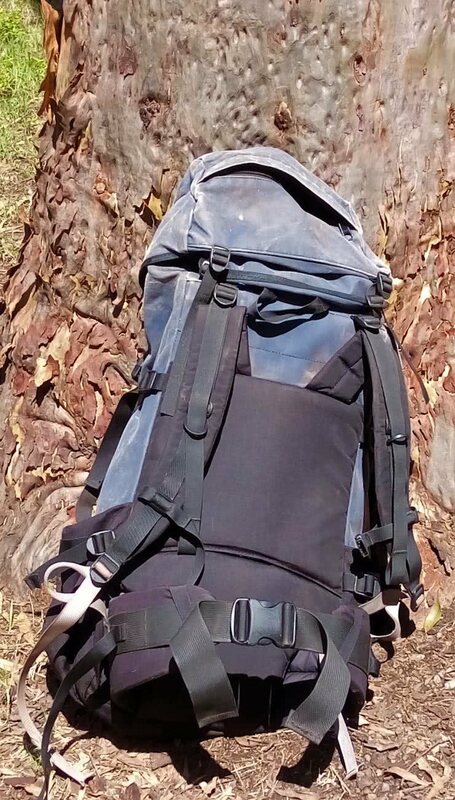 This pack is simple, a top loader with one internal compartment. The throat at the top is a synthetic, with a drawstring to close and a strap to keep it all together, standard fair on a canvas pack. The drawstring and strap are a bit long, but this is easily tucked away. The hood is able to be adjusted to suit the amount of stuff in the main compartment and has two pockets. I use these for my electronic gear, emergency gear and first aid kits. There is a loop at the top, which I frequently use for pack hauling up cliffs. There are two water bottle holders, a luxury by my standards. However, when pack hauling and scrambling, the bottles are prone to fall out. So, if you’re doing this sort of stuff, it’s best to keep everything inside your pack. They can also double up as places to stow bushwalking poles if you use them. There is one last pocket, the front pocket. Not overly large, but useful for those things you need often. More often than not, this is where I stow my climbing rope. If you were after more features, they are able to do this for you, but at a cost. However, I can’t see the need for anything more for the conditions I walk in. Why would I want an ice-axe strap/thingy? Or a helmet pocket? Or a sleeping mat/tent strap? They are good for other places in the world, but not the majority of walks in Australia. My Korowal is yet to be destroyed and Summit Gear is my favoured supplier of packs. Other brands are held in high regard by other bushwalkers. Everyone I talk to has their preference and reasons for their choices. Each bag is a trade-off. For off-track walks, with pack hauling and thick vegetation, this is pack is worth looking at. For tracked walks, this will last you a long time. However, its not a cheap or entry level bag. For the entry level walker, this pack would function as well as other brands on tracked walks. If you’re looking at a premium bag, built for Australian conditions, the Summit Gear Korowal 75 is definitely worth a look. Stuart is a Metallurgist, living in south east Queensland, Australia. He spends most weekends taking youth outdoors with volunteer organisations and friends, and has been doing this for over 10 years. When not outdoors, he can be found in a smelter in some part of the world.